In the not so recent past, there was a fundamental presumption that doing your best work happened as you sat at your desk in front of your computer. Offices over the past century were all based on this line of thinking. Today, this presumption no longer fits. Like most things, the traditional ways of operating have fractured and there’s a heap of new choices about. In particular, I think there’s three massive workplace trends that are creating new ways to work. It’s not just our phones that have become mobile. We now have laptops or tablets we can put in a small bag and head to our new office: the coffee shop. I love the cleverness of the term ‘coffice’. We’ve also cut the umbilical cord to the internet and now we can plug into our phone, a portable wi-fi device or the free wi-fi at our office. An alternative to the coffice is a co-working space. 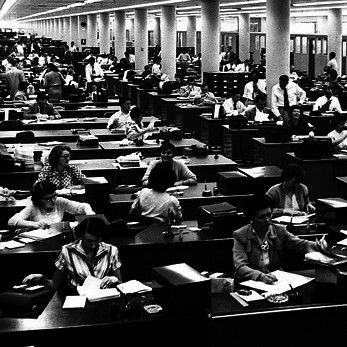 Essentially, you pay a modest fee to be able to work in an open-plan hot-desked environment surrounded by your fellow social worker bees. Tip: Is your ideal work done in solitude or surrounded by others? This could help you decide where you work. Another aspect is one I’ve been following for awhile and have even started to adopt for myself. I have a preference for visual things. I write words, I read them, I draw diagrams and I love infographics. However, the new digital technology promotes a different mode: the auditory channel. For instance, I’ve started listening to podcasts, plus I’ve created my own. The great advantage of this audio channel is that I can do several things at once. I can listen whilst I go for a walk, I can listen whilst at the gym or I can listen as I wash the dishes. Did you notice that you can’t read a book whilst you do these things? Audio has some advantages. And, with the help of Siri on the iPhone and improved dictation software, plus cheap headsets we can do a lot more things via voice control. I think this is a massive trend and we’re only at the thin edge of this wedge. Tip: Is your ideal work visual or auditory? This could help you decide your best way to receive and create information. This massive trends reverses a trend built over the past few hundred years. Previously we worked in the fields and then jobs emerged where we stood by machines all day. Then, it was considered a promotion to be able to sit down and work all day. Now, this is being overturned. A third great trend in ideal work emerges from updates in our understanding of how our bodies work and ultimately our health and wellbeing: quite literally, sitting down all day at a desk could be killing you. When I first heard this I thought they were exaggerating. And, they’re not. It may not come as a surprise to realise that human beings didn’t evolve to sit down all day. We’re meant to be active creatures. Here’s a great info graphic on the dangers of sitting from Mashable. To overcome sitting, there’s a new trend toward stand-up desks and even treadmill desks. Yes, that is what it sounds like. You walk slowly on a treadmill as you work. Tip: How can you be more active in your work? This could be as simple as standing up every time you make a phone call. Is this the end of the desk? Well not quite. At least not just yet. And, the good news here is that the first two workplace trends can help you solve the third one. In other words, being mobile and using audio can overcome the need to sit at a desk. For instance, I now go for a work for between 30 minutes and 120 minutes most days. Sometimes I use this time to make phone calls and sometimes this is learning time when I listen to business podcasts. Next step is to start using my phone to record my blog posts and podcast episodes. I’m also experimenting with a range of stand-up desks at the moment. How can you take advantage of these three workplace trends? Love to hear your thoughts in the comments below.